Discussion in 'Colored Gemstones' started by gatorsss1981, Jan 8, 2019. I've been looking for a blue/green Sapphire that I can make into an engagement ring, and I found this one on Pristine Gemstone Jewelry. They aren't on the list of preferred vendors, and when searching for their name I found a few references but nothing really good or bad. The color seems like just what she wanted, but the pictures weren't as good as some other websites. I e-mailed them and they said they would send it to www.ishy.ca for an appraisal from a GIA trained gemologist. They also said it didn't have any inclusions with a 10x loupe. The price seems lower most of the Montana Sapphires I have looked at. I haven't bought any gemstones before, is there something that I might be missing as to why this wouldn't be a good purchase? You have pictures of the colour she wants? Cut looks fine but the stone is dark and grayish. VividRed, SparkliesLuver and lovedogs like this. This isn't a good example of blue/green color. That's why it's so cheap compared to others, bc the color isn't great . It will be dark in person. We have not looked at them in person. When she was showing me examples online she really liked the colors of these. Do you think these are different, or are they all just too dark for a ring? They all seem really dark to me too. Maybe she likes that? I'd double-check though. Stones typically darken a bit when they're set, so keep that in mind as well. I'd be curious about its blue side, if he can capture it. Or if you can swing it, to see it in-person and decide. I'd also inquire about these. Possibly ask for hand shots, if they interest you at all. The 1.03 might be too dark, but worth an email. chrono and lovedogs like this. I bookmarked the ones that she picked, so I'm sure those are what she liked. We didn't know that they would get darker when set. Do you have any idea how much darker it would get? Will it still show the color? The Blaze one looks much lighter than anything she picked, and the africagems look just blue to me. She did like the blue/green color of the ones I posted. Expect everything to go 1-2 (probably 2 shades) shades darker once set. There is a chart in the new to coloured gemstones sticky thread at the top of this forum which you can use to interpret that statment. As noted by others, sapphires darken when set. 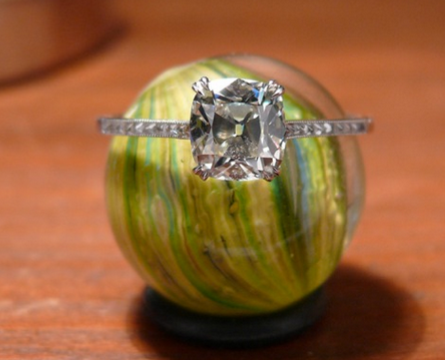 So, to get the color she wants, once set -- you need to choose a lighter stone. Something like this (you did not post a budget). Not suggesting this stone, but its a good example where you can see just how dark it gets (white gem box) versus on its own. I liked the color of the original gem. it's sold now, so I can't see the price but it looked good to me. I don't really have helpful advice except to say I bought a dark sapphire in the colour your GF likes and I love it. It is darker but looks excellent when there is sufficient lighting. I would say it looks best in the shade in natural daylight. Acinom and chrono like this. I have an Aussie sapphire that color (but less grey than the original you posted). It's darker than id like in most light, but wjne it's "on" it's amazing. It's the 5 stone shown here. I'll try to find brighter pics to compare.